Albert Camus’ The Stranger  had a powerful effect on me when I first read it at the age of 18. Recently I had cause to pick it up again when I re-read Bill Hopkins’ The Leap! (a.k.a. The Divine and the Decay ) with the aim of writing an essay on it. Hopkins’ manner of constructing a plot out of seemingly trivial, tedious, and disconnected events that suddenly come together in an emotionally shattering climax — a climax that seems utterly surprising yet in hindsight utterly inevitable — brought to mind The Stranger. The Stranger is a literary presentation of atheistic existentialism as incarnated by Camus’ anti-hero Patrice Meursault, a Frenchman in Algiers who, through a chain of absurd contingencies, impulsively kills an Arab, yet is successfully portrayed as a depraved, cold-blooded killer who must be sentenced to death for the protection of society. Yet the real danger Meursault poses is not to the lives of his fellow citizens, but to their worldview. He is an outsider (another translation of the French title L’Etranger). Meursault does not think and feel as other people do. He is an intelligent man denied higher education by poverty. He bases his beliefs on his own experiences, not on what other people believe. He does not believe in God or Providence or Progress. Meursault sees life as a series of contingencies without an overall meaning or purpose, whereas his fellow men insist on seeing patterns of significance that simply do not exist, whether they be divine Providence, premeditated criminality, or the expressions of a depraved character. Thus, after a darkly comic trial, he is sentenced to die for what is essentially an act of manslaughter simply because he does not believe in God and did not cry at his mother’s funeral, which signify depravity to judge and jury alike. There really is something unsettling about Meursault. Is he a sociopath, as the prosecutor claims? The answer is no. He does not lack feeling for his mother, for his elderly neighbor and his mangy dog, or for his mistress Marie. But he is emotionally distant and undemonstrative. I imagine him as a taciturn Nordic — a strong, silent type — who does not easily show or speak about his feelings. Indeed, he is not sure what certain words like “love” even mean. This does not mean he is incapable of love, but merely that he is loath to use words loosely. Meursault’s characteristic idleness, benign indifference, and lack of ambition strike one as depressive. He turns down a promotion and a transfer to Paris because he is content where he is. On weekends, he lounges around smoking until noon, then whiles away the afternoon and evening watching the street. When he is in jail, he sleeps 16 hours a day. But Meursault is not an unhappy man. He is never bored. The secret to his happiness lies in his ability to live in the present. Since he does not employ concepts he does not understand, he experiences the world directly, with a minimum of social mediation. He is intelligent, but not over-burdened with reflectiveness. When in jail, he occupies himself by recalling vivid, fine-grained experiences of ordinary things. He is complacent simply because he is easily contented. He is a particular kind of outsider: a naïf, a savage — and to all appearances, not a particularly noble one. Meursault’s naïve immersion in the present may be his happiness, but it is also his undoing. He is rendered almost senseless by the oppressive Algerian sun — another reason to picture him as a Nordic rather than a Mediterranean type — particularly on the day of his mother’s funeral and on the day he shot the Arab. In both cases, he reflexively reacts to his environment, because his sun-baked brain is simply not capable of reflective action, of premeditated agency, of raising him out of sensuous immersion in the present. But others interpret his acts as springing from a lack of feeling rather than an excess — from premeditation rather than blind reflex. Meursault is a kind of existentialist Christ who is martyred because of the threat that his naïve authenticity poses to those who live second-hand, conventional lives. But Camus thinks that Meursault’s life is not exemplary until the very end of the book, when he overcomes his naïveté and comes to reflectively understand and affirm the life he had previously lived only thoughtlessly. After Meursault is condemned to die, he files an appeal then awaits either reprieve or execution. In his cell, he falls into a kind of hell built on the hope and desire to escape or master his fate. He lies awake all night because he knows that the executioner comes at dawn, and he does not want to be caught sleeping. Only when he knows that he has another 24 hours, does he allow himself to rest. During his waking hours, he runs through all the possible outcomes, trying to construct consoling arguments even in the face of the worst case scenario. It is only when Meursault has to endure an exacerbating visit from a priest offering supernatural solace that he comes to his senses. In a burst of anger, he rejects the false hopes offered by the priest — and his own apparatus of false hopes as well. He realizes that all mankind erect such rationalizations as barriers to evade the certitude of death. We picture death as out there in the future somewhere, at a safe distance. Or we picture ourselves as somehow surviving it. But Meursault realizes that “From the dark horizon of my future a sort of slow, persistent wind had been blowing toward me, my whole life long, from the years that were to come. And in its path, that wind have leveled our all the ideas that people tried to foist on me in the equally unreal years that I was living through.” This wind, of course, is death, and it comes to us all. Or, to be more precisely, it is a possibility that we carry around inside ourselves at all times. It is a possibility that we must face up to. Part of Pascal’s wager is that if we believe in Christianity and turn out to be wrong, we will have lost nothing. 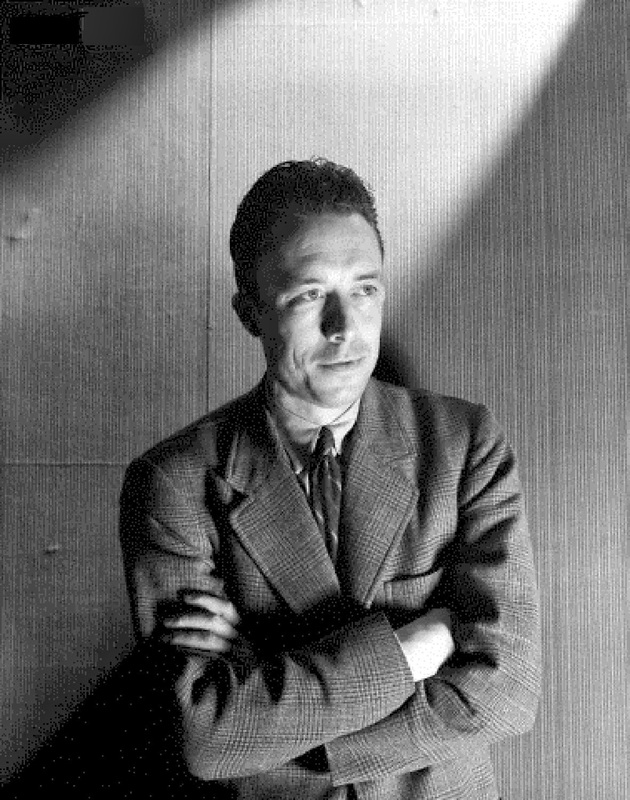 Camus disagrees: if we believe in any system of false consolation in the face of death, we will still die, but we will have lost everything — everything real — for we will never have truly lived in the world around us. Hope for an unreal world deprives us of the real one. So perhaps we should at least try to live without supernatural consolation. But to do that, we must embrace the leveling wind, allowing it to carry away false hopes. We must squarely confront the terrifying contingency and finitude of life. We must let go of our fear of death in order to truly live. For if we cease to fear death, we should be free of all lesser fears as well, which will give us the freedom to make the most of life. But this does not merely allow us to accept our mortality, but perhaps also to love it for adding poignancy to life. This realization brings Meursault peace. He understand why his mother, as she neared her death in an old folks’ home, took on a fiancé: “With death so near, mother must have felt like someone on the brink of freedom, ready to start life all over again. No one, no more in the world, had any right to weep for her.” And Meursault did not weep, although at the time he did not know the reason why. Now that Meursault had faced his mortality, he too “felt ready to start life all over again. It was as if that great rush of anger had washed me clean, emptied me of hope . . .” It is the the absence of false hope that allows him to face death and to experience freedom. The priest mentions that he is certain that Meursault’s appeal will be granted, but at this point, it does not matter, because whether his death comes sooner or later, Meursault has embraced his death as a potentiality he carries at all times. He continues: “. . . gazing up at the dark sky spangled with its signs and stars, for the first time, the first, I laid my heart open to the benign indifference of the universe. To feel it so like myself, indeed, so brotherly, made me realize I’d been happy, and that I was happy still.” Meursault had always lived his life as if the universe were benignly indifferent, i.e., there is no cosmic plan, divine or secular, but merely a play of contingencies. To “lay his heart open” to such a universe means that Meursault is for the first time coming to reflective awareness of the previously unstated presuppositions of his life. And he realizes that his life is good. That he was happy, and that he is happy still. The Stranger ends with defiant, enigmatic words: “For all to be accomplished, for me to be less lonely, all that remained to hope was that on the day of my execution there should be a huge crowd of spectators and that they should greet me with howls of execration.” Why would Meursault be more lonely if his fellow men did not hate him? Because he has embraced his mortality and recognized his kinship with a Godless, aimless universe. He is no longer a stranger to the real world. Thus his estrangement from the unfree, inauthentic human world that condemned him is complete. The Stranger is not really a political novel, but it belongs on the “Red Pill” curriculum. When I first read The Stranger, it harmonized nicely with my adolescent individualism and alienation. Today, I have outgrown the individualism, but the alienation is still with me, backed up with a slew of sound reasons. You cannot overthrow a society you are invested in. You can’t be a citizen of a better world until you are a stranger to this one. So Meursault’s proud pariahdom should be an example to us all. Note: There are several translations of The Stranger  . On purely literary grounds, I prefer Stuart Gilbert’s 1946 Knopf translation (which I have quoted above with some modifications) over more recent efforts.